Lobby groups in United Kingdom are calling for a ban on secondhand clothes exports, accusing Britain of “dumping” in East Africa. Fashion Revolution, among other non-governmental organisations, argue that East Africa has become dependent on the unwanted Western fashion products which has had a dire consequence for its local manufacturers. It is estimated that as much as 80 percent of used clothes donated by British residents end up in secondhand markets in Africa each year. Ghana is the largest market, followed by Benin and Kenya. The UK charities argue that while used clothing provides African governments with revenues from custom duties and creates tens of thousands of jobs, it destroys local manufacturers who cannot compete. The average cost of a secondhand garment in Kenya, for instance, is between five and 10 percent of a new garment by local textile factories. In the early 1990s, Kenya had about 110 large-scale garment manufacturers. By 2016, the textile mills had declined to just 15, according to Fashion Revolution which promotes sustainable clothing manufacturing. Some industry experts maintain that it was not used apparel that drove factories out of business, but inefficient production. But critics say local manufacturers never had a chance. In 2016, Kenya, Tanzania, Uganda and Rwanda increased tariffs on imported used clothes in bid to boost their local textile industries and eventually phase out secondhand apparel. But Kenya, Tanzania and Uganda abandoned the joint position after threats by the United States to review their African Growth and Opportunity Act (Agoa) status. For Rwanda, which stood its ground, the US barred it from exporting apparel duty-free to its market under Agoa in July last year. 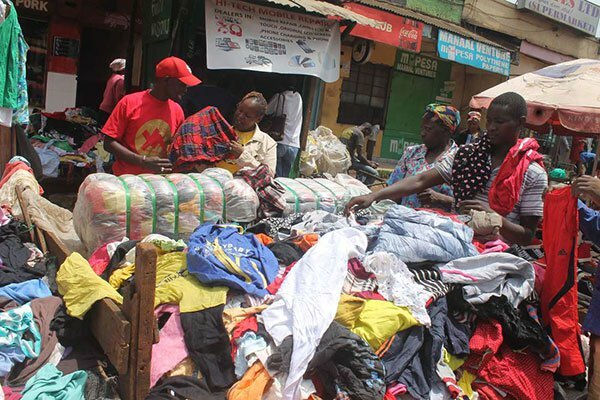 Each year Kenya imports about $42 million worth of secondhand clothes from the UK – the world’s second largest exporter of used garments after the US. In Britain alone an estimated 365 million unused apparel, worth approximately £5.4 billion ($7 billion), is given away annually, mainly to sub-Saharan Africa. But experts say this is not sustainable, putting some large charity organisations on the defence over their involvement in the secondhand apparel business. Fashion Revolution says that old UK garments heading to Africa do not clothe poor children but feed the secondhand market, adding that the apparel is not donated but sold to a textile reclamation merchant increasing profits for the charities. But some UK charities such as the Salvation Army have stopped exporting used apparel to African countries. Others say that it is too late. Alan Wheeler, the director of Textile Recycling Association in the UK, says the way forward is to promote textile recycling manufacturing jobs in Africa, adding that not all African countries have suffered as a result of the secondhand clothes market but also competition from China.